The Boot rounds up today's country music news stories from around the web. 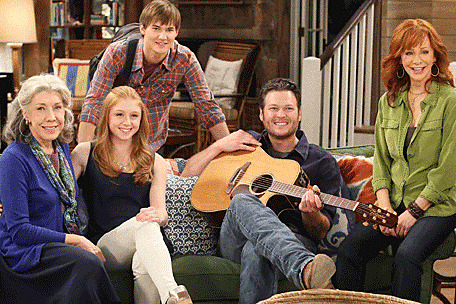 We now know a few more details about Blake Shelton's upcoming appearance on buddy Reba's sitcom, "Malibu Country." Titled "Oh Brother" and airing on ABC March 1, the episode has Reba's wayward brother, Blake, coming up with a plan to turn mama Lillie Mae's BBQ sauce into a money-making venture. But Blake's reputation for get-rich-quick schemes causes his sister to have doubts. We've seen what Lillie Mae (played by Lily Tomlin) likes to drink (and smoke), we'd have some doubts about the whole thing, too! Scotty McCreery was on hand Tuesday night (Jan. 19) at Nashville's Schermerhorn Symphony Center as the CMA Foundation donated $1.2 million to benefit music education programs for Music City's 81,000 public school students. The funds were raised via the 2012 CMA Music Festival through the CMA's the Keep the Music Playing campaign. To date, the campaign has raised more than $6.5 million to help build music labs and purchase instruments and supplies for all 144 Metro Nashville Public Schools through a partnership with the Nashville Public Education Foundation. Easton Corbin's new video for "All Over the Road" promises "Easton as he's never been seen before." That's according to the announcer on the movie-trailer-inspired teaser that's setting the stage for the singer's new clip, which will officially be revealed Friday. In the video, Easton is taken hostage by a beautiful woman, so, naturally, a wild car chase ensues. Another teaser clip is being revealed Thursday as well, before the video's official premiere. Watch a behind-the-scenes clip from the making of the new video below. In the latest episode of Dierks Bentley's DBTV, the headliner says so, so long to tour opener Thomas Rhett, as Thomas prepares to open shows for Jason Aldean. Showing that he's picked up a bit of Dierks' humor, Thomas takes the stage to deliver a tribute to his tour mate, a tender ballad called "Dierkin' It." (Actually, it's neither tender, nor a ballad. We're not exactly sure what it is, other than hilarious!) Watch it here. George Jones' final Nashville concert continues to get even more star-studded, with Dierks Bentley, Kenny Rogers, Josh Turner and Montgomery Gentry the latest additions to the ever-expanding list of performers taking the stage on that special night. The concert is set for Bridgestone Arena on Friday, Nov. 22 and will feature already-announced appearances by Charlie Daniels, Lorrie Morgan, Randy Travis, Jamey Johnson and Gene Watson.